The bendable screen craze is spreading, as Lenovo has teased its own design for a foldable smartphone. To say the Lenovo foldable approach is unique would be a terrible, terrible understatement. 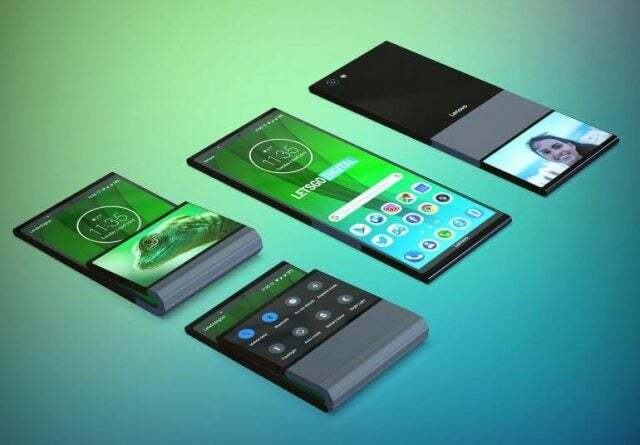 Picking up on a Lenovo patent for foldable phone tech, the LetsGoDigital website has mocked up some conceptual renders to show the technology in action. Obviously, Lenovo is far from the first company to announce a bendable smartphone. A number of companies have plans to launch foldable phones later this year, while the rest of the industry continues to frantically file patents in hopes of hitting it big with this brand new technology. However, Lenovo’s design certainly takes the cake for most unique approach so far, with secondary screens and hinges all over the place. Through a registered patent, the Chinese manufacturer has effectively announced its plans to enter the foldable phone market. Now, thanks to a series of renders produced by LetsGoDigital, we can get a better idea of how this tech would work in practice. In sort, it’s a clamshell design that is nothing if not…interesting. The device sports a bendable hinge that is far from flush against the rest of the phone; there’s also a weirdly small, secondary screen on the back of the device. The overall look elicits something of a, “Yeah, but why?” response. The patent, which you can see here, doesn’t make it look much better, clearly displaying the phone’s bulky hinge and strangely long primary screen. Lenovo has showcased a number of foldable prototypes in the past. These include a foldable tablet and a smartphone that can wrap around your wrist (nobody tell them about smart watches). But, this new iteration is certainly one of the more detailed looks at Lenovo’s tech, so far. Unfortunately, compared to the Huawei Mate X or Samsung Galaxy Fold, it’s a bit of an eye sore. With all these companies throwing their hats into the ring, it would appear that the future is foldable. The Samsung Galaxy Fold is set to hit the shelves at the end of the month, although the company has been a bit defensive about the possibility of it being a flop. The Huawei Mate X is poised to launch some time this year, despite problematic product bans preventing its US success. Yes, those are the only two companies with an actual named device slotted to hit the shelves in 2019. But, scores of other companies, such as Oppo and Xiaomi, continue to tease designs on a regular basis. Even Apple has stated that it’s interested in exploring the technology, although you’re certainly not going to see a foldable iPhone before 2020. Should You Buy the Lenovo Foldable Phone? Honestly – and this is true of all foldable phones – there’s no rush. Being a first adopter is fun, but in the long run, this is the kind of technology you want to be more thoroughly tested before you invest. That’s particularly the case when prices for a foldable phone are higher than a month’s rent for an apartment in New York. Foldable phones are still uncharted waters. There is no set precedent, no consumer research, and no previously successful model that Lenovo, Samsung, or Huawei are basing their foldable smartphones on. So if you’re willing to be the guinea pig, by all means, line up with the other tech enthusiasts for your bendable baby. But, if you’re willing to wait a few years before this tech is perfected, we’d recommend you do so.